Dr. Barbara Carter obtained her medical degree from Jefferson Medical College in Philadelphia. She completed her internship and her residency at Thomas Jefferson University Hospital in Philadelphia. In addition, she is a diplomate of the American Board of Obstetrics and Gynecology. 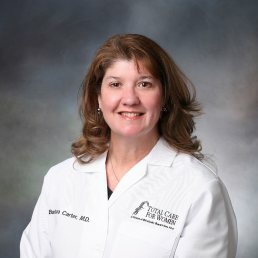 Dr. Carter has been practicing at the Elizabeth City, NC location since 1997. In 2006, she went to part-time status to spend more time with her family. Dr. Carter is active in her church and serves on many committees. She enjoys spending time with her family and has spent time in Ecuador, Africa, Haiti, and China doing mission work and has made it a family affair among her children. Dr. Carter is married to the general surgeon, Dr. David Carter, and they have three children.